Preview: San Diego State has become a model of consistency under head coach Brady Hoke and now Rocky Long. 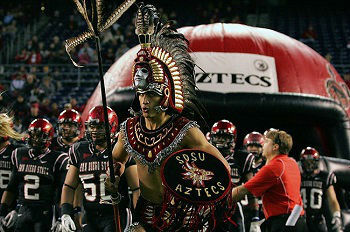 During the past 4 seasons Rocky Long has led the Aztecs to a very respectable 32-20 mark. In 2014 the team didn’t quite live up to their expectations going 7-6 overall with a 1 point bowl loss coming against Navy. SDSU lost in all of their tougher contests against the likes of UNC, Oregon State, Fresno State, Nevada, and Boise State with their only win of note coming against Air Force at home. The Aztecs return 14 starters to a unit that should be able to compete for the MWC title. The first order of business for the offense is to find their new starting QB and it looks like Kentucky transfer Maxwell Smith could be that guy. Smith has starting experience in the SEC and that’s worth a lot coming over to the Mountain West. The O-line took a hit with the dismissal of 2 players in the unit, but the line should still be decent building around Siragusa and Greene. The run game will be the strength of the offense with the return of back Donnel Pumphrey who picked up nearly 1900 yards and 20 TDs in his sophomore season. The offense will lean heavily on Pumphrey again this season. The defense was excellent in 2014 ranking as one of the best all-around units in the Mountain West. The defense returns 7 starters and they received a break with both Fely and Whittaker getting awarded an extra year of eligibility. The D-line returns 2 starters and will build around end Barret who’s coming off an injury and tackle Heyward. The LB corps also brings back 2 starters including Calvin Munson who’s the top returning perform. The secondary should be a strength with a plethora of returning players with starting experience. The secondary will build around guys like Whhittaker, Kazee, and Smith. Prediction: The Aztecs have gone to 5 straight bowl games and that streak will almost certainly continue in 2015. Kentucky transfer QB Maxwell Smith will be a great addition to the offense if he can stay healthy. Pumphrey is arguably the top player in the conference and the Aztecs will lean on him heavily. The defense is also solid enough to lead this squad to a title in the weaker West division of the MWC.